Rachel (Constance Wu) is the intelligent, sweet and loving Professor girlfriend of the sweet and handsome Nick (Henry Golding). When they travel back to his parents’ home country of Singapore, she suddenly finds out that rather than being the middle-class man of her dreams, he is a member of the elite, super-rich of this new land…one with a mysterious past. Frozen out by his ex’s bitchy clique and his snobbish mother (Michelle Yeoh), Rachel has to rely on her inner strength and a couple of pals to navigate the world of the mega-wealthy. Incredibly, this is the first English language Hollywood movie to be made with a mostly Asian cast since Eat, Drink, Man Woman in 1992*. Despite that lapse in time, the budget of this movie ($30m, just qualifying it as a blockbuster) shows the confidence that La La Land now has in developing stories that feature different ethnicities, much as has happened for African-American film-makers and actors, after the ‘Oscar So White’ campaign. 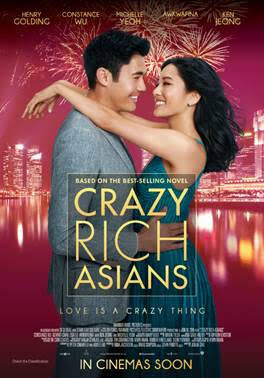 In this multi-coloured, fragrant, comic-look at the filthy rich of the sovereign city state of Singapore, based on the novel by Kevin Kwan, the wealthy are satirised with a delicate, golden feather. Flowing from the pens of Peter Chiarelli and Adele Lim, the characters are hardly crazy but merely snobby, slightly neurotic, perfectly attired spend-thrifts. They have the money to splurge on those lap-dogs, dogs and more dogs as well as far too many roomed, gated palaces. But all they obviously want is a little love and a hug every now and then. Is this what happens, on screen at least, when brash, confident Chinese-America, raised on a diet of Oprah Winfrey shows, McDonald’s and Hooters’ bars sashays into the lives of their reserved, traditional, courtly forbears back un the homeland? This is a gorgeous looking film, reflecting the surface glitter of the social milieu it represents…perhaps it is too good at reflecting it. It is all lovely to look at and the final showpiece is the wedding that forms the shimmering focus of the movie. I do! I want! I have! 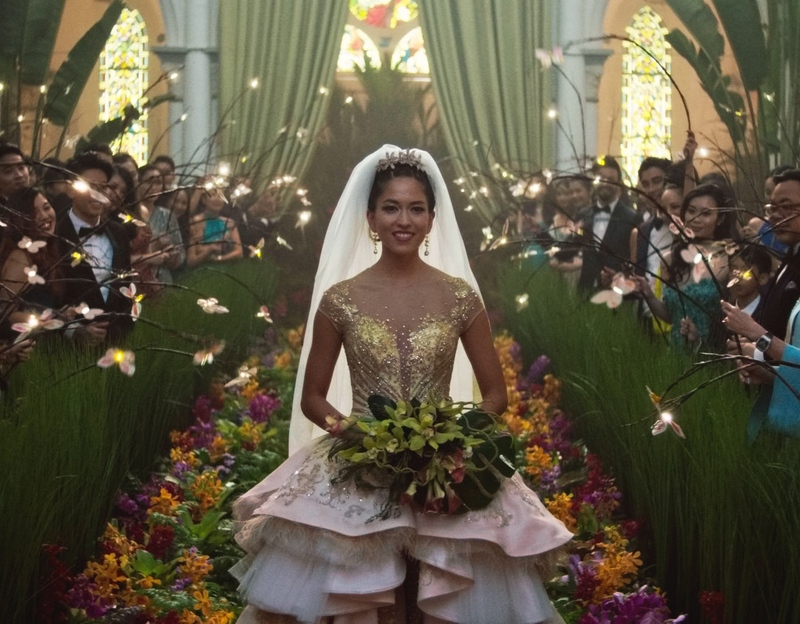 The wedding in Crazy Rich Asians (2018). Image courtesy of Warner Bros. The core wedding scene, replete with fishline butterfly lights for the guests and a false stream down the aisle, signifies not only the pure love of the two characters getting hitched, but also the OTT nature of how their social set celebrate such unions. One thing Crazy Rich Asians gets right is the cast, some of whom will be well known to international audiences. This is a classy gathering, indeed. Monster-in-law from hell…in Givenchy. 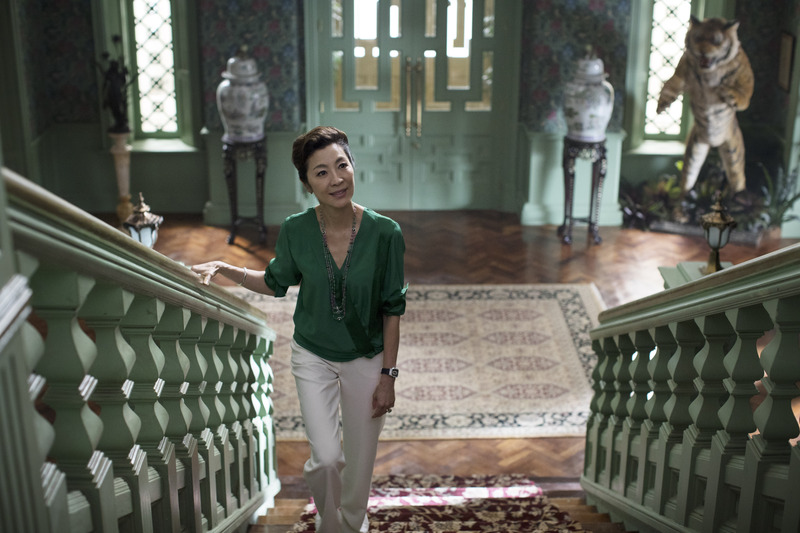 Michelle Yeoh excels as the frosty Mom in Crazy Rich Asians (2018). Still: Warner Bros. It goes without saying that former Bond girl Michelle Yeoh would excel as the critical, aloof society grand dame. Clipped with posture ram-rod straight and vocal delivery economically controlled (contrasts with the blabbering of her wealthy compatriots as they read the Bible), she is without fault as the mother-in-law from hell. Most of the humour though comes from Rachel’s spiky, fashionista gal pals: Awkwafina as Peik Lin Goh and Nico Santos as Oliver T’Sien sprint away with the whole show. With their arch eyebrows, questionable but daring clothing taste and quivering lips bursting with the ripest of insults, none of the other cast could even hope to hope to surpass them. “She looks like a clown’s tampon” – pfnar, indeed! Colour, colour, more colour…and far too many socialites. 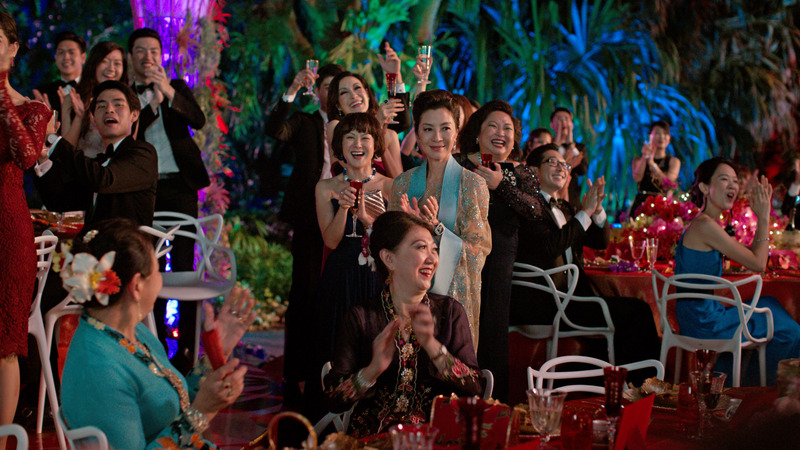 The stunning wedding reception in Crazy Rich Asians (2018). Image: Warner Bros.
Also imprinting on the memory is British actress (and star of TV’s Robots) Gemma Chan as Astrid, Nick’s sister. This woman is an island of beauty, politeness and serenity, stuck in a torpid marriage to a much less wealthy man whose feelings of insignificance threaten to overwhelm their relationship. It’s a difficult part to nail, but her poise and delivery are marvellous. This is an impressive performance, belying any opinion that stunning looking people cannot act. (Interestingly, the script works a dual lingualism. The speaking dialogue is mostly in English, but the songs, of mostly American pop, are resolutely not). This is a slick piece. It’s not as hilarious as some critics have proclaimed but still catches the attention and completely engages the eye. *See Vox article for more. 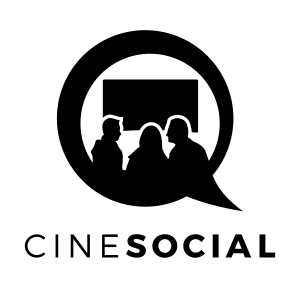 Producers: Nina Jacobson, John Penotti, Brad Simpson. Writers: Peter Chiarelli, Adele Lim. Constance Wu, Henry Golding, Michelle Yeoh, Gemma Chan, Lisa Lu, Awkwafina, Harry Shum Jr., Ken Jeong, Sonoya Mizuno, Chris Pang, Jimmy O. Yang, Ronny Chieng.